More valuable ephemera. The Stiftung Bibliotheca Afghanica Afghanistan-Institut und Archiv in Bubendorf, Switzerland, holds a substantial archive of anti-Soviet propaganda which was produced in Pakistan in the early years of the Soviet occupation. A number of the propaganda posters produced at that time are similar to the imagery which appeared on war carpets. The idea of the “puppet” dictator (in this case, Babrak Karmal) is a common motif in war carpets produced in Pakistan. The text on this matchbook cover reads “Faith, Union, Jihad”, and carries a quote from the Quran “Help comes from God, victory is near”. The volcano, with Afghanistan inscribed on it, is erupting, upsetting Babrak Karmal from his throne…. Atlas carpets (variously called World Political Map, or World Map, or Map of the World, or Mappa Mundi) are a recurrent theme on this site. While there are deep precedents for such designs, (for example, the Early 19th century antique Bakhtiari carpet illustrated at the bottom of this post), during the past forty years we have seen numerous new innovative forms emerge within the Afghan and Iranian carpet-making traditions, including those with maps as the primary motif. 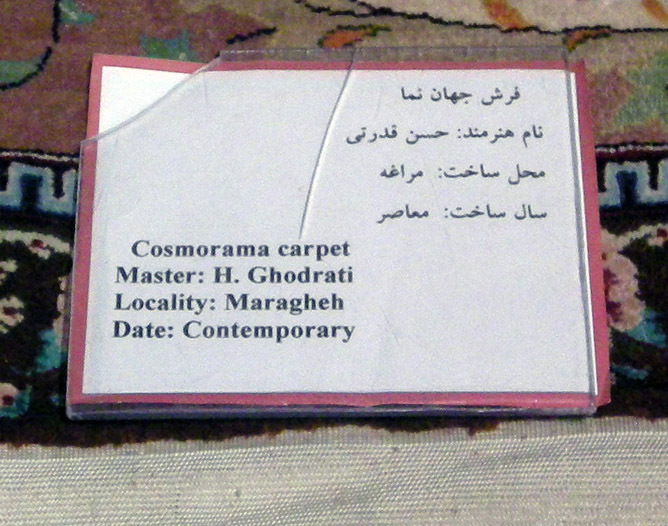 This example, the Cosmorama carpet, made by the Master H. Ghodrati, of Maragheh in northwestern Iran, was seen in the handicrafts section of The Anthropology Museum, in the Niavaran Palace Complex – the ex-Shah’s summer palace, at Sadabad, on the northern edge of Tehran, in 2007. As you see, it is simply dated “contemporary”. However, if we interpret the time-line revealed by the changing names of countries depicted, we see that The Soviet Union is still intact, as is Zaire. Therefore we can deduce that the printed atlas from which this carpet was copied was published some time between 1971 (the origin of Zaire) to 1992 (the formation of The Russian Federation). Of course that only tells us the terminus post quem, the earliest date after which it could have been made. This carpet (Early 19th century antique Bakhtiari) is illustrated in Eric Aschenbrenner, Iranian Town and Village Carpets and Rugs, 1981-2005, Yassavoli Publications, Tehran, p115. where do atlas carpets come from? 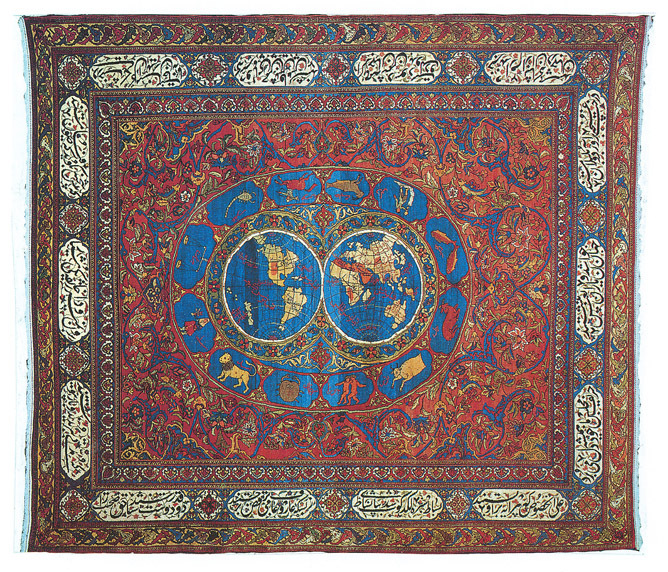 The early 1990s saw a rash of carpets depicting the map of the world – some of which are framed by militaria, some of which include military paraphernalia within the cartographic space. Some, such as this example, remain close to their origins. 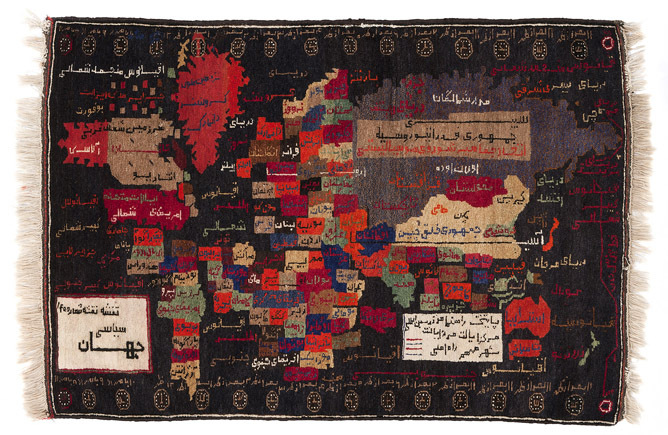 In conventional histories of European avant-garde art the Italian arte povera artist Alighiero e Boetti (and here) has often been credited with having triggered the contemporaneous production of Afghan carpets depicting the world map, and even the war carpet genre of Afghanistan in the 1980s. Boetti’s work first came into prominence following the showing of one of his first two Mappa del Mondo (maps of the world) embroideries illustrated in the 1972 Kassel Documenta 5 catalogue, which was curated by Harald Szeemann. Boetti’s work, exhibited in the section titled Individual Mythologies, was (so the story goes) produced in Afghanistan by a team of women from an “embroidery school” in Kabul. Various recent published accounts (notably that by Luca Cerizza: Alighiero e Boetti: Mappa. Afterall Books, London, 2008) assume that the virtual industry established by Boetti, when the designs for his world maps and his later imagery were outsourced to as many as 500 women embroiderers, first in Kabul, and later in the Afghan refugee camps of Peshawar and surrounding districts, was the stimulus for other forms of innovation – in carpet-making. In reality there is but a single point of coincidence. Just as Boetti’s first coloured-in cartoon of flags drawn in biro on a school wall atlas, (Planisfero politico, 1969) was the design for his first Mappa, so the myriad other printed precedents, both in school rooms in Afghanistan, and in libraries and on walls the world over, have in turn served as the model for images such as this extraordinary example we saw on Tanna last week. No atlas carpets embody any of the Boetti trademark motifs. To the contrary, they are full of their atlas origins. When you translate the text in carpets such as this you reveal a number of things: In the example above the old Soviet Union is identified as both the “Socialist Soviet Unions of Russia” and the “Federative (sic) Republic of Russia”. Given that the USSR became The Russian Federation in 1991, this would seem to provide a terminus ante quem – the date before which the atlas (and therefore the carpet) could not have been made. To further bracket the date of the original atlas (from which the carpet was copied) the country of Zaire (which existed from 1971 to 1997) is to be found in a disproportionately small patch of territory in central Africa titled “Zir” – to the east of “Congo” (which is the Republic of the Congo). And so we can deduce that the “cartoon atlas” from which this carpet was made dates from between 1992 to 1997 – the only period in which both Zaire and the FRR coexisted. 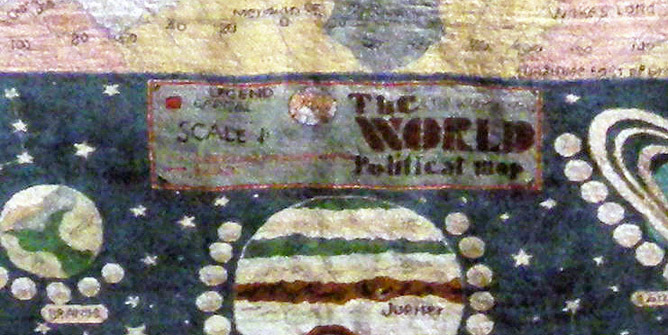 And this example also demonstrates, at least in this instance, that the atlas carpets of the 1990s derive from the kind of atlas/poster found in schools – the translation of the text blocks reads: “The Political Map of the World” “The Map no. 14 (or 140)” and in the right hand box such words as: “Guide, Capital, International border, Centre of State, Border of State, Important City, and Main Path”. In the addition international time zones are indicated by the rows of clock faces above and below. Pure atlas. Thanks to MR for the translation. This from the Sydney Morning Herald, via The Telegraph, London. Here’s the display in the National Museum of Australia. Exhibition catalogues are sometimes works of scholarship. This one isn’t. Instead it is a work of narrative imagination and polemics, and as such it is a far more striking object than most of the textiles within it. Aside from the fact that everything is from “The East” – as if that meant anything – there is no coherence to the collection, nor any discernible reason for assembling it. Here’s an example of a “map of the world” rug where there’s no argument about the date! Except maybe it’s a little too prominent! See our earlier controversy about the attribution of dates to war rugs. In the 1980s and 90s many of the most interesting war rugs (and map rugs) were imported to London by the late Reuben and his son Yuda Ambalo. 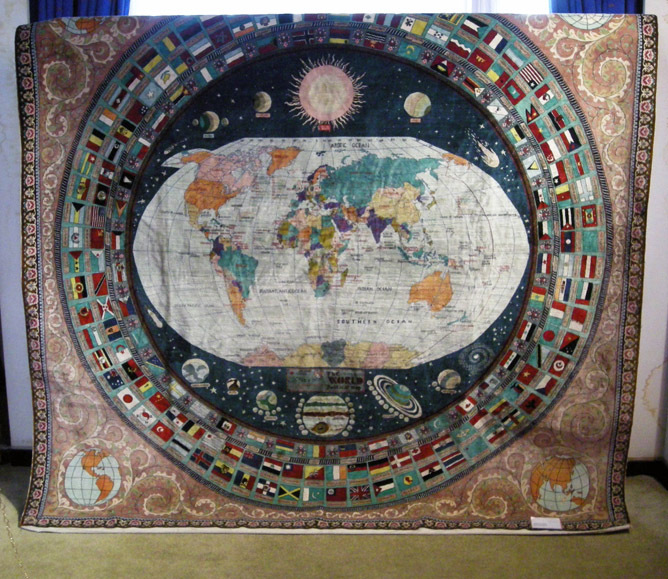 By Yuda’s account this example was the only map-of-the-world rug they actually commissioned (it’s huge, 3m x 5m) and when it arrived in London it was a great disappointment. Understandably. Beautifully made, but aesthetically morbid. 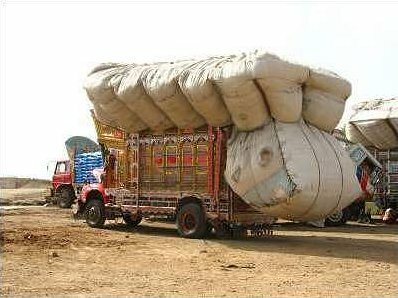 The text in Farsi reads: “ordered by Ambalo, London, 1996”.